Struggling to get an internet connection whilst away or if you can it is so far away from your router that it is weak and slow? 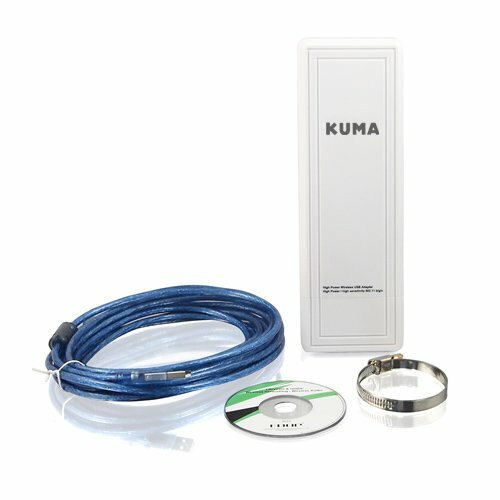 The new High power, long range WiFi antenna from Kuma will change that. Using a 16dBi high gain antenna it can connect to a far off WiFi signal, boost it and provide you with a fast and reliable internet connection. This boosted signal can then be shared among several devices (iPads, smart phones, tablets etc) using the network card already installed in your laptop. Just simply pole mount or screw the weatherproof, lightweight unit outside of your boat or vehicle and run the 5 meter cabling to connect via USB to your computer. The 16dBi Directional Panel Antenna compatible with B/G/N is capable of boosting a signal up to 1.5km in ideal conditions. The range on this antenna is top quality due to it being a directional antenna. It is tried and tested that a directional antenna will outperform an omni-directional antenna as the unit is focusing all of the power of the signal in a much more concentrated beam, and will not pick up on any interference. If you have several devices that you wish to use with the improved Wi-Fi signal provided by your booster aerial, this is possible by setting up your computer or laptop as a Wi-Fi hotspot. This will enable you to share the Wi-Fi connection with as many other devices as you require. This complete WiFi antenna kit includes the antenna, a 5m USB cable, pole mount clip and of course full instructions on how to install, set up and run your mobile WiFi for your boat, yacht, wagon, RV or truck. Auto install on most operating systems with full driver CD included as well.